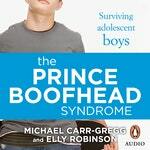 Dr Michael Carr-Gregg believes that too many Australian boys have got it too easy, and the result is a generation of ‘boofheads’. 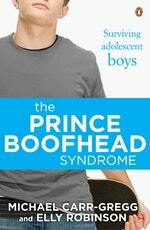 In his book, The Prince Boofhead Syndrome, Carr-Greg and associate Elly Robinson deliver straightforward advice so that the parents of teenage boys today can take back control. In the passage below, they encourage parents to reclaim a tiny word with enormous power. Each time we say ‘no’, we are giving our children the opportunity to develop emotional intelligence – the ability to handle their feelings of disappointment, anger and frustration when things don’t go their way. Being able to get over their disappointment allows them to think of more creative solutions to problems – which encourages resilience. Moreover, by modelling how to say ‘no’, we show our children how to do this too, which is crucial for their moral development. It means they can say, ‘No, I don’t want to’ when someone is asking them to do something they feel is wrong. We all want to raise responsible, considerate, cooperative children who do the right thing, but that doesn’t imply blind obedience. Morality is doing what’s right, no matter what you’re told; obedience is doing what you’re told, no matter what’s right. As a parent, your goal is to do yourself out of a job – to raise a human being who respects himself and others, and who is capable of taking care of himself. Your goal is not to be your child’s best friend or to be popular. Sometimes this means saying no and riding out the response. And while it’ll be a hell of a lot harder to say no to Prince Boofhead now he is a young adult, there will be times when it will still be appropriate. You may just have to weather a Category 5 cyclone rather than a storm. The parent or teenager makes a request or suggestion. The other person shares their reaction, without saying yes or no to the request or suggestion. Each person then outlines specific issues/problems with the request or suggestion. Both parties brainstorm solutions to the problems raised. If there is agreement, the negotiation is over. If there is no agreement, both parties try to find a compromise. If no compromise is apparent, then state differing positions as objectively and respectfully as possible and decide on a time to try again. Once you have said ‘no’, it is crucial that you stick to your guns. Children become adept at pestering, pleading and whining from an early age, but will only continue this behaviour if parents have occasionally relented. Dr David Walsh, author of No: Why Kids – of All Ages – Need to Hear It and Ways Parents Can Say It refers to it as a ‘well rehearsed routine’ where the child makes a scene and the parent quickly caves in after a brief attempt to hold their ground. ‘Kia kaha’ is a Maori phrase that means stay strong. This is easier said than done, especially when you are confronted by a nonstop querulous, tired, hormonal, cantankerous, grouchy son or when your in-laws are looking all ‘judgey’ when said son is doing a commendable imitation of the eruption of Mount Vesuvius. But we teach people how to treat us. If you relent, just as the sun will rise tomorrow morning, nothing is more certain than that you will be setting yourself up for a shitstorm of more obnoxious and demanding behaviour later on. If you’re unswervingly solid, sturdy and robust in parenting a Prince Boofhead, especially in early adolescence, it will eventually dawn on them that such behaviour is ultimately pointless in helping them get what they want at home or out of life.